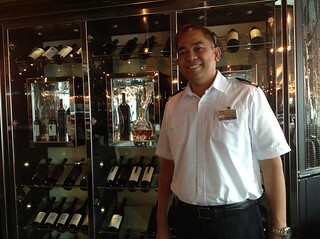 Fernando Bacsa is the Cellar Master in charge of wine selection and service on board Holland America's Nieuw Amsterdam. As we cruised the waters east of Cuba, I visited with him and asked about his work and how he came to his love affair with wine. "I grew up in Phillipines," Bacsa began. "I have three children. The oldest is a waitress with HAL. Before working with the cruise company, I was a personal butler to the President of Libya (1988-'93). During that time I served many heads of state, including the King of Kuwait, the president of Angola and the King and Queen of Saudi Arabia." Not your typical start, but Bacsa's training in hotel/restaurant management is what led him there, after beginning as a catering supervisor serving oil companies working in Libya. "We catered people in refineries from 1980-83. One morning I was told I was going to be transferred to a club owned by the President. I'm very dedicated to my work. Hardworking – Dedication – Ownership. That's always my objective," he explained. In the mid 1990s he landed a job as a deck steward at HAL Promotions came quickly – to bar waiter, then bartender. With ships visiting many of the world's fine wine regions, he used his off days to tour vineyards, acquiring a wine education along the way. "Most of my training is in the vineyard," he says, amplified with internet studies and reading wine-related books. These days he is principally stationed on the cruise line's newest 'Signature Class' ships – the Nieuw Amsterdam and the Eurodam. Every couple of weeks wines are brought on board along with all other bar supplies, which must be carefully screened In advance of sailing. The logistics of supplying a cruise ship are totally mind-boggling. We toured the kitchens of the Nieuw Amsterdam, poked into vast storage lockers, and got a tiny taste of the kind of planning that must go into every cruise. Remembering that our ship docked in Fort Lauderdale early on a Sunday, off-loaded passengers, and had maybe 6 hours to re-fuel, re-stock everything, and bring on board the new passengers. In that context, the wine provisioning is a mighty small element. But how important is it to the fine dining experience? I'd say it's crucial. This ship's selection is extensive, and divided into several tiers. Along with the main (Manhattan) dining room, guests may enjoy more specialized cuisine – Italian, Pan-Asian, steakhouse – all offering fine wine service and special selections. In the Pinnacle restaurant and bar, for example, are well-selected examples from the Pacific Northwest, including Betz, Long Shadows, Leonetti and Northstar. At the very top of the list are first growth Bordeaux and such California classics as Joseph Phelps Insignia. Guests may also bring their own wines into the restaurants, for a relatively modest corkage fee of $18. Quite honestly, I was most surprised at the quality of the every day selections. Oaky Chardonnays are less prominent than stylish, racy Sauvignon Blancs and Pinot Grigios. One evening we enjoyed an Albert Bichot 2007 Bourgogne – in perfect condition and drinking well above its class. At our Italian dinner a proprietary Muller Thurgau was offered as the white, and a proprietary (and quite excellent) Primitivo was the red. "Most of our guests now are not fond of wines with heavy oak," Bacsa notes. "That is why I often suggest something fruitier, with more citrus flavor. Sauvignon blanc, Pinot Gris. For red, people are looking for Pinot Noir, Cabernet and Zinfandel." Granted, this was a Caribbean cruise, and most people – myself included – are thinking cocktails more than vino. Nonetheless, a glass or two of fine wine with dinner was always appreciated, and always available.